Avoid unnecessary sugar on your marzipan Easter eggs. Just mould flowers or other shapes with left over marzipan instead of using more sugar in the form of Royal Icing. 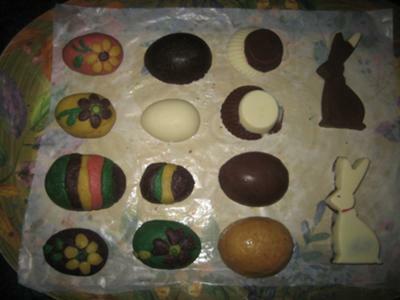 In the photo, the coloured Easter Eggs are all marzipan, the others are chocolate. Yummy!! Thanks so much for the great idea to reduce the amount of sugar needed by using the marzipan to decorate the eggs. Of course, I know marzipan is a ton of sugar, but I like the idea regardless. It's very creative and would be a lot of fun for the kids to mold and shape the marzipan to create their own designs for their homemade Easter egg candy. Thanks so much for including the photo, too! I wish more people would add photos. I LOVE looking at the work of the different candy makers, homemade or "professional."